Circuli Franconiae Pars Orientalis et Potior novissime delineata quam . . .
A fine example of J. 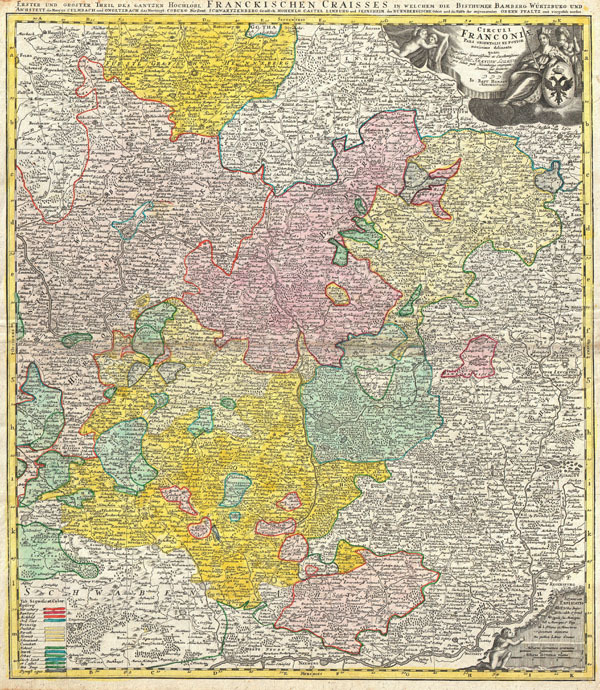 B. Homann's c. 1720 map of Franconia (Franken, part of Bavaria), Germany. Centered on Bamberg, Würtzburg, and Nuremberg, extending north as far as Gotha, south to Swabia, east to Mergentheim and east to Pfreimt (Ober Pfalz). The map is filled with information including fortified cities, villages, roads, bridges, forests, battlefields, castles and topography. Title cartouche in the upper right quadrant features cherubs an enthroned queen with a castle-like crown and an armorial shield. Legends in both the lower right and the lower left quadrants. Additional title in German outside upper margin, Erster und Groster Theil Des Gantzen Hochlobl Franckischen Craisses in welchem die Bisthumer Bamberg Wurtzburg und Aichstett ... Prepared in Nuremberg by J. B. Homann and issued in Homann Heirs' Maior Atlas Scholasticus. Very good condition. Blank on verso. A fine dark impression. Rich original color. Shirley, R.W. (BL Atlases) T.HOM-1a, #29. Stanford University, Map Collection, Germany 0467 a, b.